As I’m sure everyone knows, Kei is a planet in the universe of Marvel comics, where reptilian semi-humanoid creatures from the Fraternity of Raptors seek to obtain the amulet that gives Darkhawk his powers. While this might explain the odd looking eyeballs on the CD cover, what this has to do with a set of free improvisations is not so obvious. That said, when players move as gracefully in time with each other as they do here, there is no need for any explanation. On this set, Salamon switches from his more familiar electric guitar to an acoustic and shows tremendous facility in ringing all manner of unusual sounds from it. His ability to present the electric guitar in a new light has been described in previous reviews on Jazzviews. Here, the acoustic guitar is played with equal skill and panache. At times, he develops a flamenco-like pattern of strumming or plucking, at other times, his uses the guitar as a drum, and at all times, the selection of notes and playing of arpeggios become bewildering. This CD could be enjoyed simply as a masterclass in acoustic guitar playing, particular if you’re interested in how to make the instrument sound new and relevant in the 21st Century. However, the duet and trio combinations here bring freshness to each instrument. The combination of instruments, particularly in the lower registers when Succi or Mezei bring depth and gravitas to their playing, creates a sound that is not unlike a contemporary chamber group playing contemporary composed music. However, each piece is wholly improvised, either in trios (of which there are eight pieces) or duos. 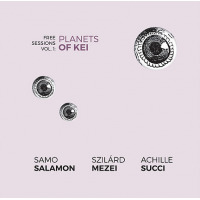 Salamon teams up with long-time collaborator Succi and this is their first recording with the marvellous viola playing of Mezei. Each of the trio pieces, ebbs and flows with well crafted and clear progression. Often, there is a sense that the pieces are being played from a well-crafted composition, rather than being spontaneously created. All three musicians are so aware of each other’s playing that they anticipate the selection of notes or change of tempo as a single unit. This is improvised playing of the highest order and a stunning addition to Salamon’s discography.